The thought of two consecutive evenings dedicated to the piano concerti and symphonies of Brahms will not have appealed to all music lovers. Although it's enough to put the true fanatic – and there are plenty of them – into a state of tear-drenched ecstasy, many others might prefer a low-calorie alternative. 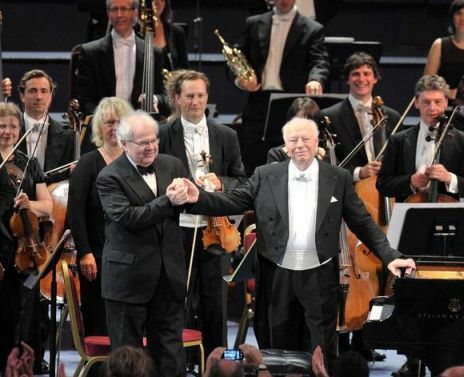 But on the basis of this, the second concert, those not automatically drawn to what one of my undergraduate lecturers called 'steaming Teutonic pudding' needn't have worried: under the ever-poised baton of Bernard Haitink, this Brahmsfest was lean, graceful and almost entirely without self-indulgence. Brahms' Second Piano Concerto, while as symphonic as they come, nonetheless centres on sustained and sometimes extraordinarily intimate dialogue between piano and orchestra. Emanuel Ax, under the High-Definition scrutiny of BBC 2 as well as a packed RAH, showed little outward interest in his audience. Instead he turned frequently to face the orchestra, his playing unspectacular to watch but in constant expressive exchange with the Chamber Orchestra of Europe's fine players. Indeed, the sense of chamber music-making that communicated across the cavernous wastes of the RAH made me almost envy those watching the concert at home, with their privileged intrusions over Ax's shoulder and into the individual workings of the orchestra. For once, though, there was no sense of struggle with the acoustic difficulties of the RAH. This was a performance in which quality and clarity of sound were tantamount: the concerto's first movement in particular was so crisply articulated as to approach brusqueness, with Ax's playing dry but never desiccated. Such precision paid dividends in heavily scored passages, which could so easily have turned sickly under the RAH's mixing-bowl dome, but also worked in quiet sections (the third movement above all) in which every minutely-etched detail carried to breathtaking effect. There were times, admittedly, when – despite such careful blending and characterisation of both solo and tutti passages – the eternal brightness of Ax's Steinway was at odds with the COE's expensive October sunset. It was, then, a striking and unexpected treat when, in the final movement's closing bars, the horns let rip for one moment only in their own burnished glory. After the interval, Haitink re-emerged, fully visible at last. Of course, there's not much to see: he conducts within an extremely small envelope, his feet firmly planted, efficient hands supplemented by the occasional, significant tilt of the head. His reading of Brahms' last symphony was as intricately marshalled as one might have expected from the first half – no histrionics here. This was partly to do with the symphony itself: Stephen Johnson's programme note quotes the nineteenth-century music critic Eduard Hanslick, who after first hearing the symphony complained that 'all through I felt I was being thrashed by two terribly clever men'. But while Haitink certainly brought out Brahms' thematische Arbeit in all its tightly woven machinations (a characteristic once again not to every listener's taste), it was by no means the over-intellectualised tour-de-force bemoaned by Hanslick. Startling details emerged in an unusual show of musical democracy. Phrases passed seamlessly and with equal commitment across the ensemble, from the inner string parts to superb woodwind soloists and back again: an orchestral equivalent of the European Parliament, perhaps, albeit without the tedium or the army of translators. The COE's relatively small scale also allowed for rare moments of expansion without risk of emotional imbalance: not least in the slow movement (taken here at a particularly stately pace), where Haitink encouraged an immense richness of tone from the strings. Even in the symphony's third and most exuberant movement, the performance remained clean-cut, Haitink navigating Brahms' massive contrasts in dynamics to produce both finely articulated pianissimo passages and thunderous climaxes. There is, though, little 'chamber music' in the symphony's last movement, with its monumental gathering up of previous thematic threads and inexorable momentum towards those final chords. One might have wished for a greater intensity of forward motion, despite Haitink's brisk tempo and seemingly boundless energy. But the solos – in particular the flute, which was endlessly seductive – remained as high-class as any we had heard all evening, and the brass choir was magnificent.